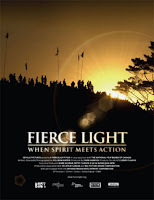 We saw the movie Fierce Light: When Spirit Meets Action, by Canadian filmmaker and media activist Velcrow Ripper, last night. It's currently playing at film festivals and in selected theatres around the world. Anyway, a shining light in the movie was Congressman John Lewis, a hero of the 1960s civil rights movement in America, who was beaten almost to death for taking part in a peaceful march for voting rights (on a day later known as Bloody Sunday). Mr. Lewis exuded a calm during his interview that I have long forgotten. He reminded me of the importance of doing our activist work in a spirit of love and solidarity — and compassion. I came away with this zany urge to send flowers to Rex Tillerson, CEO of Exxon Mobil Corporation. Exxon is the world's biggest oil and gas company, which makes Tillerson one of the Earth's biggest enemies and one of my least favourite people on the face of the planet. I realized that we can't save our love and compassion just for the poor and climate change vulnerable (though they certainly deserve all our solidarity). Rich people like Tillerson, whether they know they are frying their grandchildren's future or they are so ignorant that they don't realize they're doing it, are going to hell either way. (Oops, sorry, that wasn't very loving, was it?) I'll report back if I do send those flowers. You could help me figure out what to write on the card!